THE State Government is spending $7.6 million to put guard rails alongside the Warrego Hwy between Blacksoil and Gatton. But the move to put rails alongside straight stretches of the highway has bemused road users and angered Ipswich councillor David Pahlke. 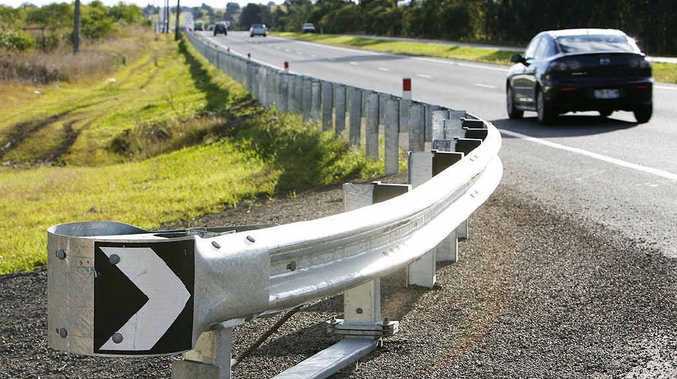 The Department of Transport and Main Roads says the guard rails are part of a program of road safety improvements along the highway. A department spokesman said the Warrego Highway Safety Improvement Program was developed in response to road safety audit recommendations. "The program is investigating intersection safety improvements and improving safety by removing roadside hazards and installing barriers," the spokesman said. He said the recommendations were based on factors including road geometry, speed and roadside environment, surface condition, lighting and crash history. "The guard rail being installed as part of this project has been designed to accommodate the combined effect of these factors," the spokesman said. "TMR is currently implementing this program of road safety improvements along the Warrego Hwy between Blacksoil and Withcott. "This program of road safety improvements will cost a total of $7.6 million. "The road safety improvement project started in April is expected to finish mid-2013. "Work has started at various locations between Blacksoil and Gatton. Work will continue west from Gatton to Withcott in due course. Works incorporate both the westbound and eastbound carriageways." But Cr Pahlke was outraged by the guard rail project, which he said was a waste of money. "I can't see the logic or commonsense of doing it. It's a straight, wide road with farming land either side," he said. "I think it's overkill. It's the biggest waste of money I've seen, especially when the Blacksoil interchange is crying out for more funding. "Eleazar Dr is a much bigger danger to people. It has a far greater potential to kill people than a straight stretch of wide highway."